Over the past year or so, we’ve posted many tutorials that demonstrate some of the many things you can do with a single sewing pattern. There are so many creative opportunities within each pattern! We’ve called this series Customizing with Oliver + S, and all of these tutorials have been collected on our tutorials page so you can find them easily when you need them. As part of that series, and to celebrate the release of our expanded collection of Oliver + S Singles patterns, I thought it would be useful to show you some examples of how our raglan T-shirt can be altered to make a variety different looks. Let’s make this into a short series. And who better than to help kick it off than some of our favorite sewing bloggers? Cherie color-blocked the sleeves of her raglan T and used a burnout knit to add a little texture to the shirt. 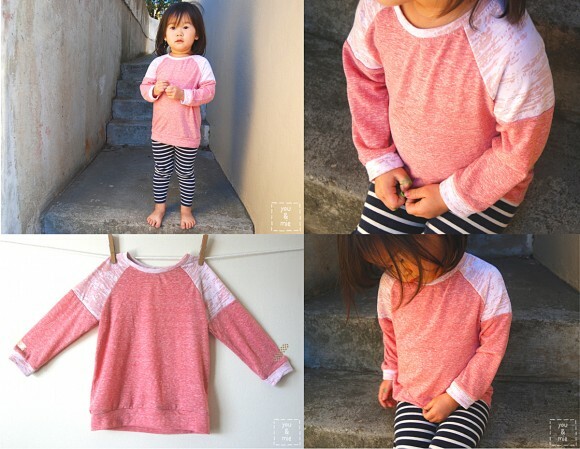 You can read all about her darling take on the pattern on her blog, You and Mie. And Kristin turned the raglan pattern into a sweatshirt! Cute and easy to do, this makes the raglan pattern even more versatile because it can become a layering piece both as the base T-shirt and as the sweatshirt on top of it! Kristin simply went up a size and shortened the sleeves and hem before adding rib knit. You can read more about it at Skirt as Top. Next week I’ll have some more ideas for the raglan T-shirt for you. Have you done any customizing of this pattern yet? If you have, let us know! these are so lovely! i think my little needs a raglan sweatshirt! That is so cute, Holly! Thanks for posting the link. I love it. Holly, that’s adorable. Thanks for sharing. I’ve done a simple modification, short sleeves and hem bands on the sleeves, evocative of 1980s baseball Tshirts. I think I’ve only ONCE made the Raglan T as per the pattern. Otherwise it’s been customized somehow! A few short sleeve T’s, a sweater, a dress and LOTS of stencils, transfers and some applique. Such a fun pattern to play with. I need to remember to leave it alone and make some more plain ones soon! It’s such a wonderful pattern Liesl!